MainAll NewsDefense/SecurityKindergarten or training facility for kidnapping soldiers? Kindergarten or training facility for kidnapping soldiers? After Hamas claims IDF bombed kindergarten, COGAT publishes footage showing Hamas terrorists training at the site to kidnap a soldier. On Saturday, the IDF attacked a high-rise building in the Gaza Strip that Hamas regularly used to train for terror activity. 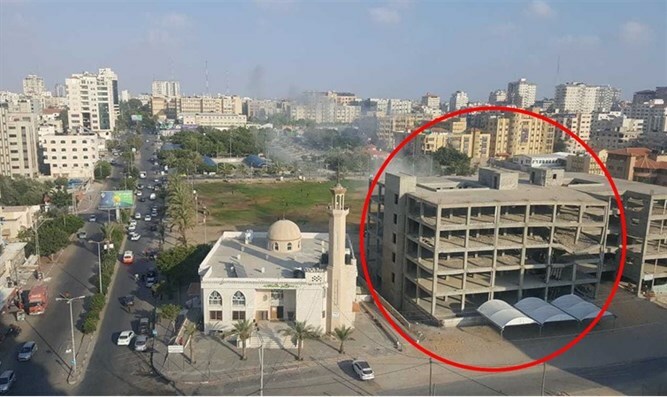 The Coordinator of Government Activities in the Territories, Major General Kamil Abu Rokun, revealed in the “Almansk,” the Facepage of the Arabic COGAT, the evidence: "In the video before you, you clearly see members of the Hamas military wing conducting an exercise in the area of ​​the building that was attacked. Yesterday there were allegations that this was an innocent civilian building and a kindergarten." "The truth is here," says Major Abu Rokun. “Ground-based combat training, an exercise that simulates the kidnapping of an IDF soldier and his descent into a tunnel of terror - these are the goals for which the building was used! Not only that, the training structure is also located near a mosque, a holy place used for prayer! " The Coordinator of Government Activities in the Territories addressed the residents of Gaza: "Understand, whoever carries out terror training near a children's park does not care about your children."